The Pontifical Swiss Guard presents...a book like no other. From the elite protectors of the Popes and Defenders of the Faith for more than 500 years, a unique collection of exceptional recipes from simple to sublime, everyday staples to holiday feasts. Here are the classics served at Vatican tables for centuries and the finest of modern cuisine. Best of all, this book pays tribute to Pope Francis, Pope Benedict XVI, and Saint John Paul II with the personal favorite dishes from their homelands of Argentina, Bavaria, and Poland. A marvelous cookbook and so much more. The Vatican Cookbook features superb photographs that take you behind the scenes to secret and special places of Vatican City. Walk the hallowed halls of St. Peter's, the Vatican Museums, and the Sistine Chapel. Enjoy the stories and legends of the Swiss Guard handed down since the days of Michelangelo. 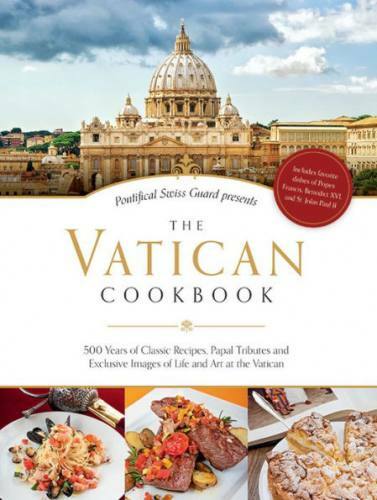 For all who love to cook and share meals with family and friends, and for all who are fascinated by the wonders and grandeur of the Vatican, the Swiss Guard is pleased to offer you...The Vatican Cookbook in Hardback.